I still can’t believe that NASA forgot to mention to me that this space telescope would be at the 2017 SXSW. 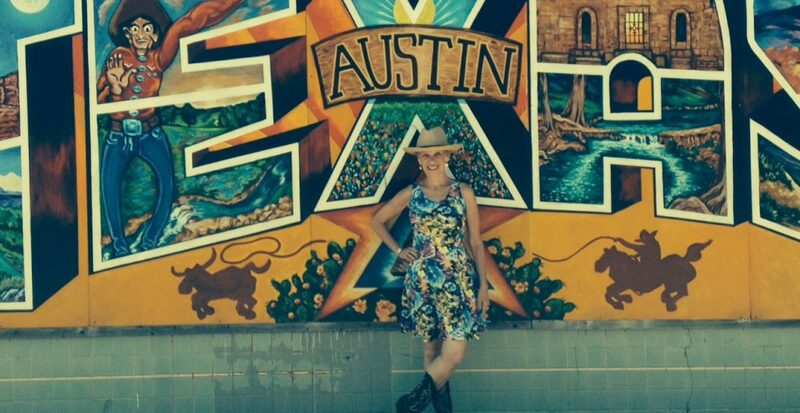 How can we live in Austin and not experience South by Southwest? I fall asleep doing some positive thinking as to how that might happen. The very next morning, a new pal texts me with a link to free events and says to be sure not to miss them! South by Southwest (SXSW) is a yearly event held every March in Austin, Texas. It is known for its music and film festivals and conferences that focus on what’s next in music, film, culture and technology. People travel here from all-around the world and proudly wear the badges around their neck that they have paid anywhere from $825 to $1250 for. As if the city isn’t already alive on any given day, during SXSW the excitement elevates. Pop-up events are held all over the city, then gone the next day, only to appear at a new location. Music is playing everywhere, there is a great vibe on the streets and you never know what experience awaits you around each corner. A young man dressed in an authentic sailing outfit from 1845 invites us to view a premiere of the new AMC show The Terror. As we enter the shipping container and seat ourselves in a boat, I am wondering what good could come from a ship called the HMS Terror. All of a sudden, it’s dark and the screens all-around us feature excerpts of the thrilling story of a British Royal Naval expedition in search of the Northwest Passage. If the sounds and sights don’t make us feel as if we are really there, the cold air blowing and the snow falling down on us really does! Feeling like we are in need of a respite, we opt to visit the Yonomi Townhouse next. There is nothing like touring a smart home and learning about all the gadgets that can make our lives easier or just more bizarre (a light show in your living room?!) after visiting their complimentary open bar. The sounds of a DJ lead us to our next stop. We are invited to have a MAC makeup artist touch us up, then head onto lavish photo sets decorated like a private jet and a yacht and told to pose as if we are high-rolling imposters, just like the new Bravo show The Imposters. I won’t lie to you, I am very fussy about food and politely decline anything that is being offered. Touted as scientifically modulated, energy healing, fueling body, mind and spirit and clean eating, I wonder why the samples are all mostly khaki green in color. Though we could not convince Mr. Wiz* to enter the PeaceBox with us, JC and I did share the experience. We first choose from one of eight temporary tattoos called “Mindful Marks.” These are placed on us (arm or hand) as a reminder of our meditation intention. I must say, it really brought out the latent rebellious streak in me. I wore it proudly, missed it when it washed away a few days later and wondered deep down inside if I actually might be a candidate for a tattoo. Oy vey, not another shipping container! This time though, we are promised that this one is actually a studio that teaches meditation and mindfulness techniques. Once the headphones are placed on our ears, we close our eyes and relax. After 15 minutes, we rejoin the world feeling totally renewed. We finish the day with a visit to Bulletproof, a cutting-edge food and beverage company. The oxygen bar is a new experience. It is said to remove toxins from the body and strengthen the immune system. If nothing else, it makes me feel energized and invigorated, which I now blame for my decision to try the Vibe Plate. I can only attribute my heightened state of light headedness for accepting the sample of coffee with butter that is handed to me next. I don’t even drink coffee and am not sure that anyone has the right to drink butter, so I’m still perplexed as to how it all happened. Deciding it best to call it a day and end our SXSW adventure, I stroll away with visions of the new edgier version of myself dancing in my still woozy head. It is the shouts from Mr. Wiz and JC that bring me back to reality. And remind me that I am walking the wrong way home. *Who’s who? See “Cast of Characters” on the “About” page. This entry was posted in Travels and tagged amoxiegirl.com, Austin, Linda Thornton, south by southwest, SXSW by Linda Thornton. Bookmark the permalink.